Agronomists help farmers manage their crop with advice on everything from crop cultivars to fertilizer rates to marketing. It’s challenging to be an expert on everything, but a few core competencies can go a long way to improving the level of service. 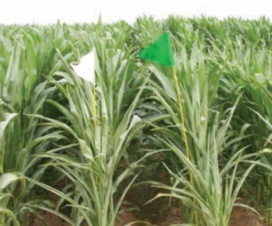 Agronomists are also responsible for communicating environmental best practices. Along with fertilizer rates come messages of source, time, and place, the 4R principles. The same is true for spraying, with messages of spray drift, resistance management, and economic thresholds part of the consultation. Let’s remember that we should not be indifferent to the potential consequences of our recommendations. Here are six skills that an agronomist should know about spray technology. 1. Recognizing major nozzle models and their spray quality and pressure requirements. Application technologists are often asked to identify nozzles and recommend spray pressures for clients. It’s a skill that anyone can develop with just a bit of homework. First, learn the colour-coding of nozzles – colours identify flow rates and follow an international standard that all manufacturers have adopted. ISO Colour coding of major nozzle sizes, as well as application volumes at benchmark speeds. 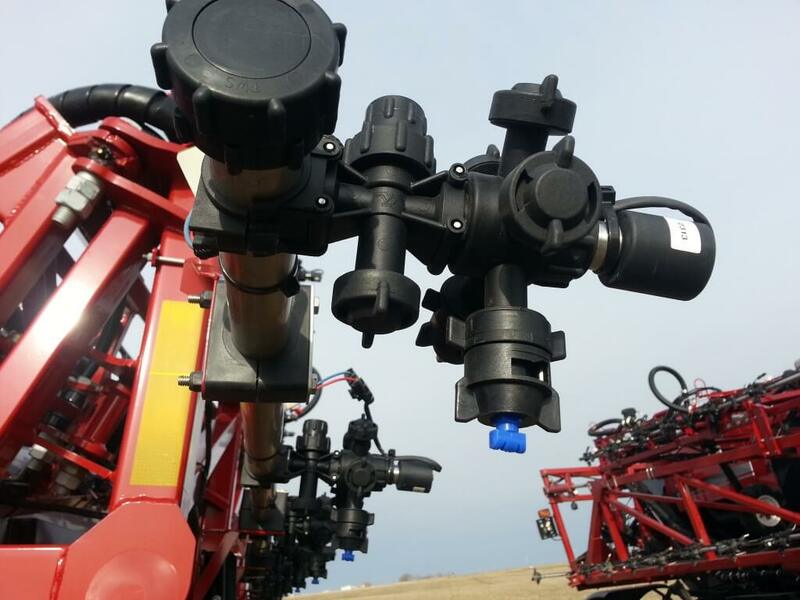 Next, focus on the common nozzles on the major sprayers. John Deere sprayers will typically have three main air-induced nozzles, made for John Deere by Hypro, the Low-Drift Air (LDA), the Ultra Low-Drift (ULD), and the GuardianAIR Twin (GAT). Those with ExactApply, John Deere’s PWM system, will see the non air-induced 3D, the Guardian (LDX), and the Low-Drift Max (LDM). Recall that PWM flow control should not be used with air-induction tips. Almost all Case sprayers have PWM, called AIM Command. Case uses Wilger ComboJet bodies and nozzles, with the ComboJet ER, SR, and MR most common, sometimes the DR or UR for dicamba. New Holland/Miller with PWM (called IntelliSpray) are also likely to have these tips, but because these brands have TeeJet bodies on their booms, they require an adaptor for the proprietary ComboJet caps. Otherwise, PWM units often use TeeJet’s TurboTeeJet (TT), Turbo TwinJet (TTJ60), and Air-Induced TurboTwinJet (AITTJ60), the only air-induced tip approved for PWM use by TeeJet. Conventional spray systems (i.e., no PWM), will commonly have (in alphabetical order) the Air Bubble Jet (ABJ, actually labelled BFS for their manufacturer, Billericay Farm Systems), the Greenleaf AirMix (AM), the Hypro GuardianAIR (GA), and the TeeJet AIXR. Many sprayers will have a twin fan for fungicides, primarily for fusarium headblight (FHB) management. The Greenleaf Turbo Asymmetric Dual Fan (TADF), the Hypro GuardianAIR Twin (GAT), and the TeeJet AI3070 dominate, as well as a number of custom configurations using splitters and twincaps. Where dicamba is applied on Xtend trait soybeans, some special nozzles may be used to meet label requirements for coarseness. The TeeJet TTI is very common, but Greenleaf developed a special set of tips called the TurboDrop XL-D and the TADF-D. Wilger’s version, mentioned earlier, is the UR. John Deere has just announced their new ULDM. That covers 95% of what you’ll encounter in the North American market. In Europe, add some Lechler nozzles (ID3, IDTA, IDK, IDKT) to the mix. In Australia, Arag is gaining ground. Identifying the nozzles on sight is the prerequisite to finding out their average droplet size, called spray quality. Often, the inscriptions are worn off, so visual recognition is required to get there. We’ve published a visual identification guide with pictures of the major nozzles here. 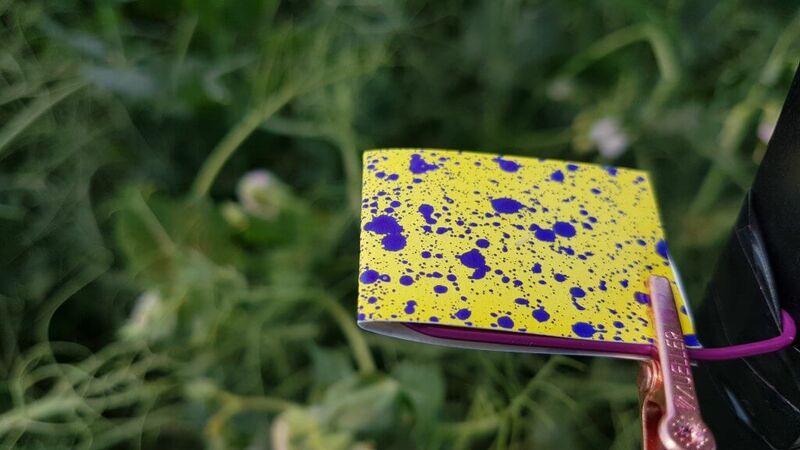 Knowing the relative spray qualities produced by these various nozzles will get you bonus points, but you’ll need to do some extra research to get there. This skill will make you popular on the farm and at the office. A very frequent question is “what size nozzle do I need for this new sprayer?”. The best way to approach the answer is to ask several questions. Does the sprayer have 20” nozzle spacing? (90% of sprayers do). What is the desired water volume? What is the expected average travel speed? 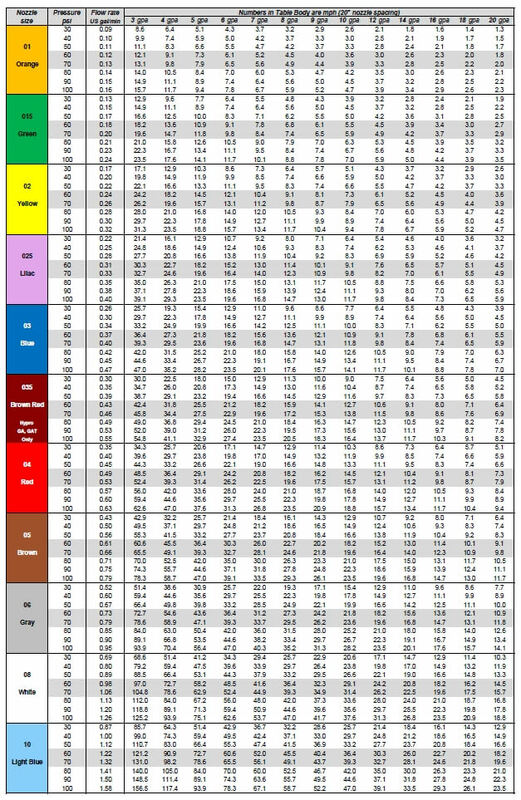 The first question guides you to the appropriate calibration chart, which can be downloaded here or can also be found in all sprayer catalogues. We explain how to use these charts here. Calibration chart for 20: spacing, in US units. 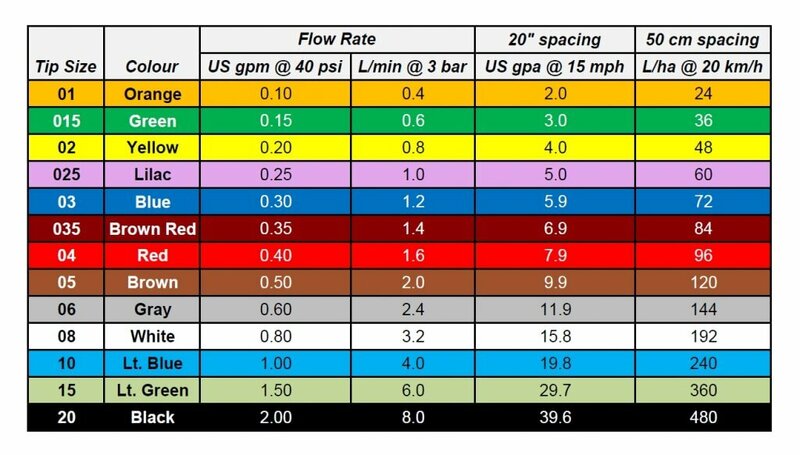 If you don’t have a chart handy, use this shortcut: on a boom with 20” spacing, at 5 mph, every 0.1 US gpm capacity at 40 psi delivers 6 US gpa. So if you need to apply 12 gpa at 15 mph, an 06 size will get you there at 40 psi. That’s ballpark. In metric, with 50 cm spacing, at 10 km/h every 400 mL/min (01 size) at 3 bar delivers about 50 L/ha. To deliver 200 L/ha at 20 km/h would require an 08 (white) tip. 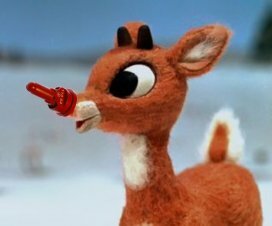 Of course, if the tip is air-induced, make adjustments to speed or size to accommodate the higher pressure requirement of these types of nozzles. Remember that spray pressure is key to performance, therefore the operator needs to drive at a speed, or use a volume, that results in the correct spray pressure. PWM technology has been on the North American and Australian market for two decades, but it remains poorly understood by those who do not use it. PWM will continue to gain popularity and has implications for nozzle selection and sizing. Traditional rate control in the field involves the use of spray pressure to match liquid flow rates to travel speed. The rate controller knows the width of the boom (entered by the user), the travel speed (from gps), and the desired application volume (entered by the user). 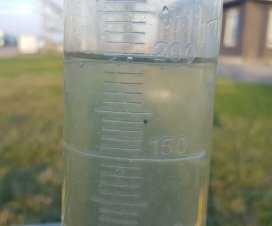 It does some math to identify the flow rate it needs, and compares that to the sprayer’s current flow meter reading. If the current flow is less than what’s needed, the sprayer increases pressure to increase flow. This happens continuously in the background. When an operator speeds up, the pressure increases, and vice versa. As a result, the pressure (and therefore droplet size) will fluctuate with travel speed, and that can result in inconsistent spray patterns, coverage and drift. PWM involves the installation of electronic solenoid valves at each nozzle body. These valves pulse on and off at 10, 15, 50, or 100 Hz, depending on the manufacturer. Each pulse contains a brief, complete shutoff of the flow. The proportion of the time the valve is open during a pulse is called the Duty Cycle (DC), and this is proportional to the flow through the nozzle. When the system requires more flow, it no longer increases pressure. Instead, it increases the DC. The advantage of this approach is that nozzle pressure can now stay constant, ensuring consistent coverage and drift. There are other advantages of these systems. Each nozzle can be controlled independently, offering high resolution sectional control and turn compensation. Nozzle selection and sizing are both affected by this technology. Nozzles need to be sized larger, with about 30 to 40% more flow capacity ideal. The DC will therefore run at 60 to 70%, optimal for speed fluctuations and turn compensation. Air-Induced tips are not usually recommended because their pattern deteriorates with pulsing. We’ve written about PWM here, here and here to get you started. A very useful indicator of the success of a spray operation is an assessment of “coverage”. This term refers to a qualitative combination of droplet density and percent area covered, and can be quickly assessed using water sensitive paper. We’ve explained the use of WSP here and here. Water-sensitive paper being used to assess spray coverage. using experience built on years of doing this. Water-sensitive paper is also useful as a record, for quality assurance. A spray application is conducted and part of the record is an image of the deposit. Should a performance issue arise, this will help settle it. Often, a sprayer problem can be traced back to an issue with its plumbing. There could be mysterious sources of contamination. The pump might not be building pressure. The agitation isn’t running. Or you need to drain all the remaining liquid from the tank. Sprayer plumbing seems intimidating for a number of reasons. It’s become complex on most modern sprayers. It’s hidden under the sprayer belly. All the lines are the same black colour, so they’re hard to tell apart. But it’s not as bad as it seems. Basic plumbing is the same on all sprayers. The pump draws the spray mix from the bottom of the tank, the sump. It may also have options to draw clean water from an external supply, or from the clean water tank for wash-down. 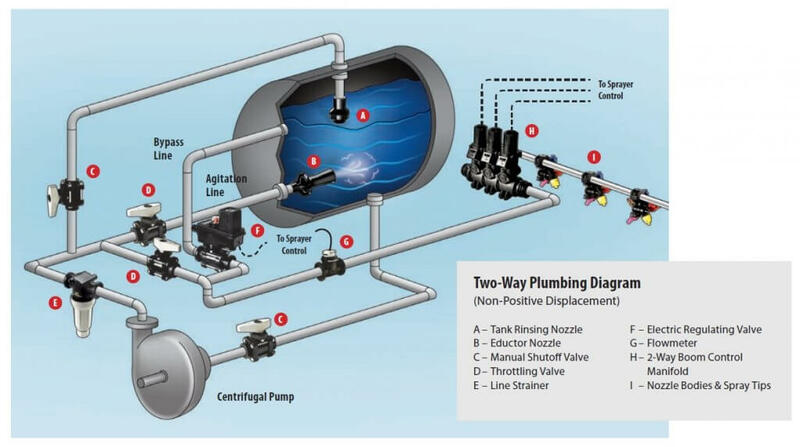 Typical sprayer plumbing for a centrifugal pump (Courtesy TeeJet). When spraying, the less is returned to the tank, the higher the boom pressure. There may be several ways back to the tank, via agitation, via bypass (sparge), or via wash-down (used only when the pump draws water from the wash-down tank). Usually engineers can’t help themselves and introduce several what-if features that complicate the situation. But with a bit of know-how, and a flashlight, the plumbing system can be deciphered. Pro tip: A centrifugal pump’s inlet (suction) is always the centre of the pump, its outlet (pressure) is at the periphery. It’s commonplace to recommend a specific crop protection product that matches the crop and pest situation. 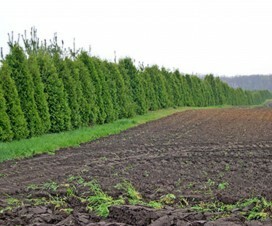 Recommending an ideal crop or pest stage improves the recommendation. But a truly successful outcome requires one additional step, advice on the application method. The customer may need to know if product performance depends on water volume and droplet size. Some products are more sensitive to this than others. Perhaps there is a specific nozzle type that may be helpful. The classic example for application method is Fusarium headblight in wheat. The basics are straightforward. An agronomist recommends the fungicide, and guides the tight application window with a field visit to stage the crop, plus a look at the disease risk forecast map. But true application success requires an angled spray, with a coarser spray quality plus relatively low boom height to make it all worthwhile. That’s a full-featured recommendation. Common herbicide applications also benefit from additional information. Some tank mixes and weed spectra allow for coarser sprays than others, and the ability to spray coarser means a wider application window and therefore more accurate timing. Other tank mixes may pose a significant risk to drift damage, requiring special measures to prevent a problem. Identifying those opportunities adds value. 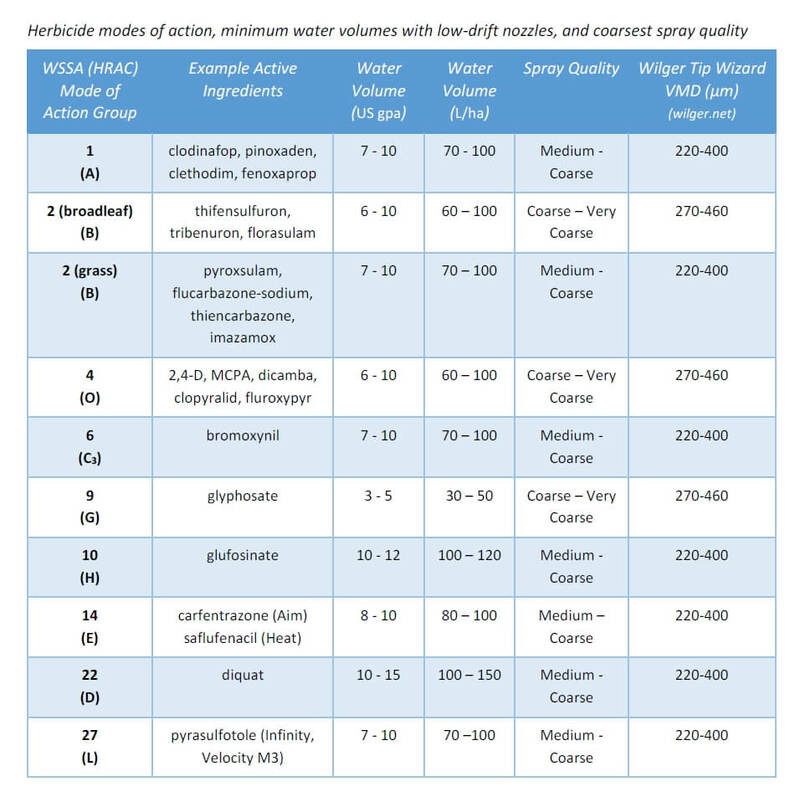 Water volume and spray quality recommendations for major herbicide mode of action groups. Newer labels for dicamba (Xtendimax, Engenia, Fexapan) and 2,4-D (Enlist Duo) have very specific instructions for drift prevention. This information must be shared with customers to ensure that their drift liability is covered. Are there other skills that you feel agronomists should have? Please share them with us by contacting us at the bottom of this page.